2009: The product of many months of work, Paul set up the business, freelancing in graphic and web design from his back bedroom in Tyldesley. 2012: Getting busier, Paul grew the business registering as a limited company, moving into an office in Leigh and hiring our Jordan as an apprentice web developer. 2013: We made more room for Jonathan to join as a graduate Graphic Designer. Meanwhile, Jordan completed his apprenticeship and has been our Front-End Web Developer ever since. 2014: We moved into Acorn Court to allow us to continue to grow as a business. Our portfolio was developing, including design and web development work for many local schools and businesses. 2015: In March Lauren joined the team as our administrator and office manager to free up some of Paul’s time, enabling us to offer our clients a greater range of strategic marketing services. In September Vicki joined as our Marketing Manager, having worked with us as our freelance copywriter. 2016: We went international! Our first overseas client came on board, giving us an exciting new foothold in the UAE. In September Nathan joined as an apprentice Graphic Designer, lending Jonathan a hand and learning the tricks of the trade. 2017: Marketing Manager 360 really grew, working closely with more clients more regularly to deliver a full range of marketing and creative services that achieve real outcomes! In December we moved into Offices 1 & 2 to give us more room to creatively plan all our projects. 2018: Nathan completed his apprenticeship and we launched our own rebrand which really communicates CRE8’s uniqueness. In August Graduate Marketing Executive Jazmin joined the team to support Paul and Vicki with delivery of our Marketing Manager 360 projects. 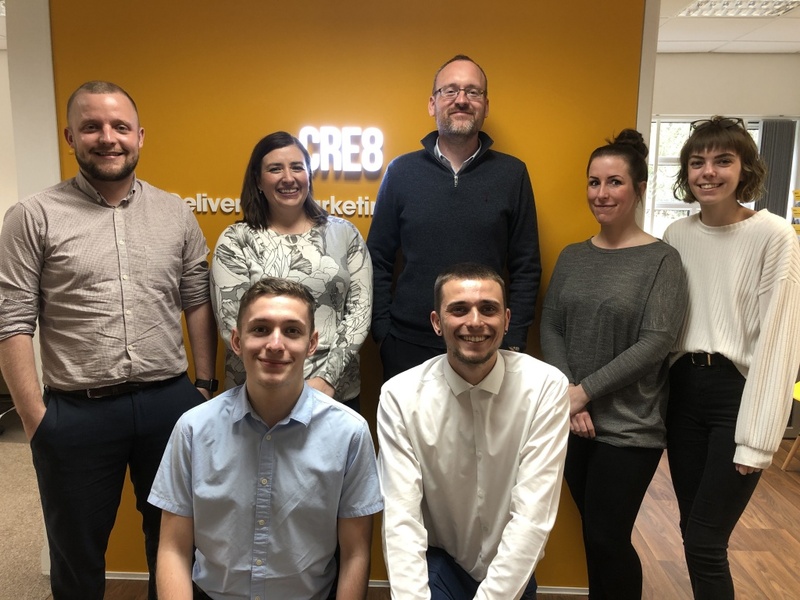 2019: Continuing to grow and communicating our brand more widely, CRE8 has sponsored Leigh Centurions RLFC’s Stefan Marsh for the 2019 season. Your Marketing Goodguys are really proud to be supporting our local team! Our business, services and client portfolio have grown, diversified and matured into a complete – and unique – marketing and creative service offering for our clients. Everything that we do, we’re proud to do differently from others in the marketplace, producing work that gets results for our local and international clients. Our new brand, launched in 2018, communicates our DNA: our team’s strengths, depth of knowledge, passion and how our talents are providing our clients with tangible results every day. We’ve come a long way in the last 10 years, and we look forward to many more, working alongside our fantastic clients and continuing to grow and strengthen both their businesses and ours.